The Digital Literacy Project is an initiative of the Atwater Library and Computer Centre through which we foster positive digital citizenship and engage people in creative new media production. Since 2007 we have worked with over 60 partner organizations and schools and through them, more than 4,500 individuals of all ages and stages. Union United Church is one of our many valued partners. During the Fall of 2015 and Winter of 2016, we conducted digital media workshops for members of their congregation who coordinate church activities, developing the individual participants’ skills while building capacity for the Church. 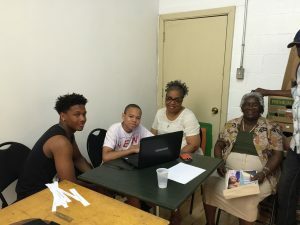 On July 20 2016, at Union United, we celebrated our partnership with “Seniors Do-It-Yourself Digital Media Day.” Congregation members and our facilitators demonstrated how to make postcards with scanned photos, create pamphlets and brochures, and digitize cassettes, vinyl, and VHS. The following video “Festi Pointe 2012” by youth of the YMCA Pointe-Saint-Charles – Teen Zone is a good example of our community collaborations. The teens picked the topic and with our mentorship, they planned, shot and edited the video themselves. We’ve helped many other groups and schools make videos — in all, more than 130 videos, most now available on YouTube.